I had an amazing day yesterday, and thought I’d share it. Remembering back to my mother’s mysterious wooden box with the badge of the Royal Sussex Regiment engraved on the top and also knowing my father fought in the Royal Sussex Regiment during World War 2, I went searching for more information about this Regiment. I spent most of the day going back and forth online, searching one lead then another, but never quite coming up with what I wanted. I stopped for a cup of tea and a look at my email. And what do you know! I spend all day looking for The Royal Sussex Regiment, and in the end – The Royal Sussex Regiment found me. I love it when that happens! I have had a wonderful time looking around this site, and I thought perhaps my family and friends might be interested in knowing Gordon is remembered here. 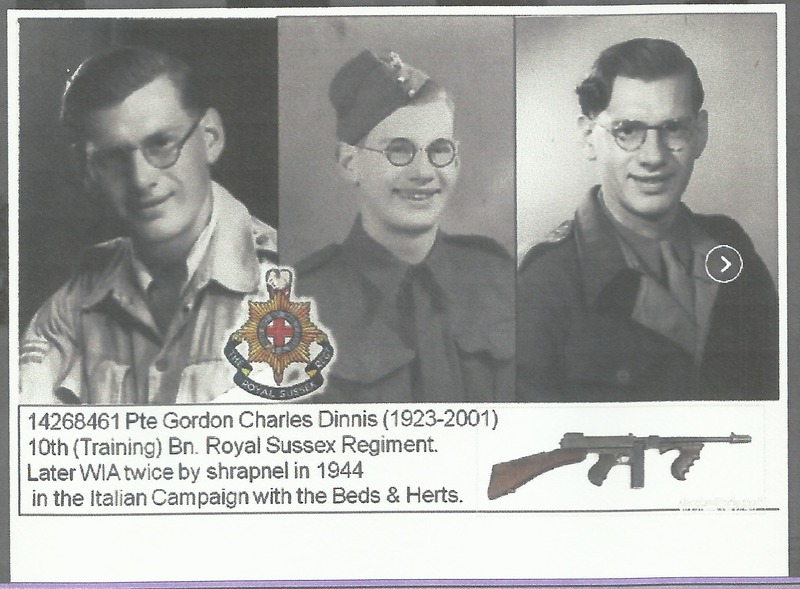 This entry was posted in DINNIS, Enid May Howells, Gordon Charles Dinnis, HOWELLS, World War 2 and tagged Family History, History, The Royal Sussex Regiment. Bookmark the permalink. Jackie, how wonderful! What a “coincidence”! On another note, just for the record, I am going to be happy when the snowfall is over on WordPress. It isn’t so hot for migrainey people . . . .